Smart contracts are agreements with fixed terms between two companies. They are displayed in the new smart contracts page where they can be created and booked. 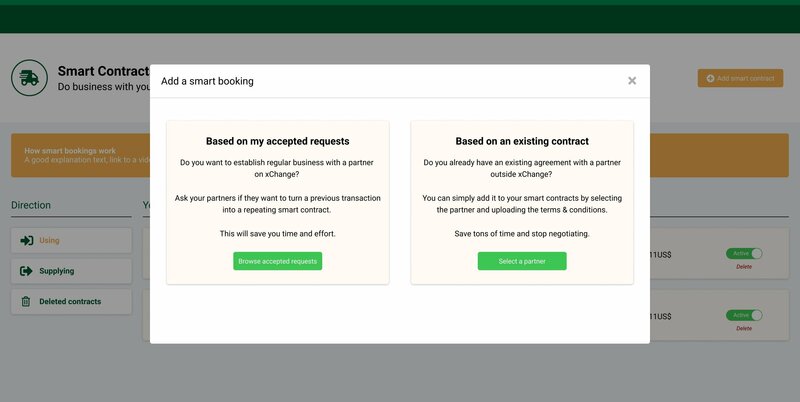 Booking a smart contract creates a request that we call “smart request”. A smart request can be directly accepted by the supplier as the terms are fixed. (5) Beside the specialty that the terms cannot be edited and that the smart request can be directly accepted – smart contracts behave just like normal requests!